Mini Wizard GI-46B base box This box has inexpensive tube plus a power supply built into the same case, This is a 1 tube GI-46B a pair of them would run you about $90. 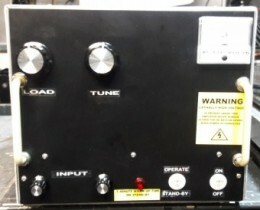 The box is ran on 120volts AC with a 20 amps of draw. I drove 20 watts of RMS watts into it and about 140 watts swing pep. OUTPUT Was 200 dead key watts with a swing of 1400 watts on a bird peaking meter. Very clean audio.